Greg Gotcher of Go Crazy Marketing and I have decided to put on a blogging seminar for realtors. More and more, I'm finding realtors are looking for an edge in today's tough real estate market. Some have alerady turned to blogging and have enjoyed great success. If you are one of those, great (In fact send me an email, I'd like to hear your story first-hand). It's not your father's real estate market any more. It's not even 2005 any more. 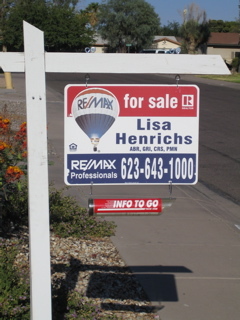 In 2005, anyone who could fog a mirror could make a living as a realtor in Phoenix. I have a friend who sold his house a couple of years ago and he received multiple offers even before the sign went up. Today the average time on the market for homes like mine in my neighborhood is 90 days. Within the square mile I live in, there are a dozen homes for sale. Like any other blogger, a realtor should use her blog to build trust and credibility. People don't do business with your company, they do business with you. Write your blog so that people will connect with you and come to trust you. That's all well and good, but you often hear me say "Trust comes from demonstrated performance." It doesn't matter how nice your client thinks you are if you don't sell his house. You need to be using every tool at your disposal to promote your client's house as widely as possible. A house-specific blog can do just that. One of the great features of a Typepad blog is that Google is notified the instant you create a new post: No waiting for weeks until the Google spyder gets around to you. That's why you can have such a dramatic affect upon your search engine rankings in such a short time. A house-specific blog is a great way to get good ad copy in front of potential buyers too. I know that each and every one of you wants to say more about your clients' house that you can fit in that MLS listing. A blog is one answer. There is no limit to the number of words or photos (or video, for that matter). For example, accompanying the photo of my garden, I talked about the sweetness of the cantelope and the freshness of the snap-peas. Any potential buyer trapped in an apartment and harboring a secret desire for a garden is going to say, "Oh Yeah!". Of course, doing this for your clients probably means you are going to have to polish your copywriting skills. You are probably really good at cramming the right words into that MLS listing. With a blog, you have a chance to stretch, tell a story, and really draw your potential buyers in. I'll talk more about that in another post. Some of you are saying, The average agent doesn't have time to be keeping up a blog for each of his listings! Yup, you are absolutely right. And that's why the average agen will remain average. In a tough market like we are in now, agents who are only average won't survive. But what about Buyer's Agents? If you act primarily as the buyer's agent, then you have a whole different set of considerations. And that will be the topic of my sext post. Steve Groves wrote a great post today about real estate blogging and while it has a global reach, it needs local support. While I know what Steve means, I had an entirely different thought regarding global vs local. And my thought was this: While we normally think of blogging giving you global reach, the realtor's treasure trove of knowledge about his local area is his crown jewel. It's almost 'local blogging with global impact'. Except for maybe a city-specific restaurant blog, I think this is true more for real estate than almost any other industry. It's true that the market for a house is global (Someone for example, may buy my house just to have a place to stay during the Super Bowl next year. So getting my house in front of a geographically-dispersed bunch of potential buyers is important. From the seller's perspective, my agent really needs to have her finger on the pulse of my neighborhood. She needs to pick up on trends long before they are significant enough to be statistical. Similarly, buyers need to leverage a different kind of knowledge posessed only by an agent who is really familiar with the area. (How good are the schools, for example). A real estate agent-blogger needs to blog not only about her client's properties, but also about the neighborhood and local events. A good real estate blog focused on my neighborhood would give any prospective buyer a really good picture of what living here is like. I know this is tangential to your point, Steve, but it is an interesting cooncept nevertheless. I recently put my home on the market and as I was painting the garden fence the other day, my thoughts drifted to the intersection of Social Media and Real Estate. This happens to be an area that my friend Steven Groves is pretty passionate about. I met Steve several months ago and I've had the pleasure of working with him on a couple of projects. One of Steve's pet projects is figuring out how to leverage Second Life in the real estate industry. Steve gave a great presentation on Second Life at the Phoenix Social Media Club meeting last week. Steve has done some great work (and thinking) about this convergence of web 2.0 technology, social media, and real estate. In fact, Steve has a great series of blog posts surrounding a concept he calls Agent 2.0. A few days ago I told Steve that I wanted to get together and explore his thoughts on this topic and last night at dinner we did just that. The real estate market here in Phoenix has cooled off quite a bit, yet the number agents who are not leveraging web 2.0 technologies and social media for the benefit of their clients is amazing. Steve is on a mission to change that. As a result, today Business Blogging Pros announces the formation of its Real Estate Division, with the purpose of educating and coaching real estate agents about the power of blogging and how to use it to better promote and market their clients' properties.